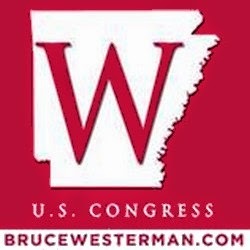 Arkansas Conservatives Opposing Democrats, Liberals & RINOs who support progressive liberal agendas affecting Arkansas. The 2016 Election Republican Victories in Arkansas require accountability. Today, prior to the passage of H.R. 5594, the National Strategy for Combating Terrorist, Underground, and Other Illicit Financing Act, Rep. Hill spoke on the House Floor in support of the bill. H.R. 5944 requires the president to develop and publish a whole-of-government strategy to combat money laundering and terrorist financing. I thank the Chairman for yielding and I thank Mr. Lynch for his important legislation. H.R. 5594, which I stand in support of and as a cosponsor today. I want to thank Chairman Fitzpatrick and Chairman Hensarling for the opportunity to serve on the critical taskforce on terror finance. It is an important but less discussed part of the war on terror. This War on Terror requires a more nuanced approach to achieve victory than previous U.S. conflicts. It requires the full coordination and collaboration of allied financial, cyber, diplomatic, and military capabilities. And, one of the most underreported aspects of winning this war has been infiltrating and cutting off sources of funding for terrorist groups. Like its occasional intermittent engagement, accompanied by long periods of a lack of resolve, and a lack of clear rules of engagement that will produce victory, occasionally this administration has not been consistent in pressing for victory in the war on terror finance. But since San Bernardino and Paris we see the administration aggressively targeting ISIS’s funding sources. Instead of intermittent, we need a coordinated strategy to combat terror finance between all of our government agencies and with our allies to make sure it is the most effective in countering this menace. The Financial Crimes and Enforcement Network, or FinCEN, is our Nation’s front line at the treasury for the government-to-government and enhanced government-to-private sector coordination that this national strategy puts in full force. I was pleased to cosponsor Mr. Lynch’s amendment that was passed in last week’s Financial Services Appropriations legislation that includes an increase for FinCEN’s budget. I am proud to join my colleague Mr. Fitzpatrick and our committee on this important bill to require the administration to develop a national strategy to combat terrorist, underground, and other forms of illicit finance. I urge my colleagues to support this important bill, and I yield back the balance of my time. 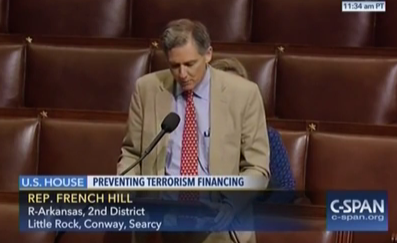 Tags: U.S. Rep. French Hill, Dist 2, Arkansas, Stopping Terror, Finance important, H.R. 5594 To share or post to your site, click on "Post Link". This site is an Outreach of the ARRA News Service. Fair Use: This blog may contain copyrighted material the use of which has not always been specifically authorized by the copyright owner. Such material is made available to advance understanding of political, human rights, economic, democracy, and social justice issues, etc. We believe this constitutes a 'fair use' of any such copyrighted material as provided for in section Title 17 U.S.C. Section 107 of the US Copyright Law. Per said "Title," the material on this blog is distributed without profit and the included information is for research, educational, or satirical purposes. If you wish to use copyrighted material from this blog that go beyond "fair use," you must obtain permission from the copyright owner.